Domaine Verdant’s vineyards are situated in the heart of the Yamhill-Carlton AVA, one of the premier Oregon pinot noir AVAs defined within the much larger Willamette Valley AVA. Located approximately one-hour southwest of Portland, Oregon, the Yamhill-Carlton AVA is home to some of Oregon’s oldest and best known pinot noir vineyards and wineries. Domaine Verdant’s moderately-sloped, south-facing vineyards are located at an elevation of 280 to 340 feet (80 to 100 meters) above sea level – a range of elevations with very important microclimatic consequences for our wines. Our vineyard’s moderate elevations and location help to confer a cycle of day and night temperatures that is ideal for flavor, aroma, and color development in our pinot noir and chardonnay grapes. During the growing season, daytime temperatures typically range from mid-70s to low-80s degrees Fahrenheit (23 to 29 degrees Celsius), while nighttime temperatures range from 54 to 64 degrees Fahrenheit (12 to 18 degrees Celsius). Our moderate daytime temperatures are typical for summers in the Willamette Valley. A distinctive microclimatic feature of our vineyard site is the mid-afternoon winds from the Pacific Ocean that regularly move through a gap in the coastal range of mountains known as the Van Duzer Corridor, bringing cool ocean breezes across our vineyards and preventing accumulations of afternoon heat that can degrade the delicate processes of flavor and color development in pinot and chardonnay grapes. The fortuitous combination of moderately warm days with cool afternoons and evenings in our vineyards brings a depth and delicacy of pinot and chardonnay flavors that make our wines sought after by oenophiles around the world. Domaine Verdant’s moderately-sloped, south-facing vineyards are located at an elevation of 280 to 340 feet (80 to 100 meters) above sea level – an elevation with a particular geological consequences for our wines. Hillside soils through the central Willamette Valley of Oregon are generally sedimentary soils from ancient ocean floors uplifted with the tectonic plate movements that created the coastal mountains and hills of the Pacific Northwest USA. Following the last Ice Age about 12,000 years ago, however, a cataclysmic event called the Missoula Flood saw a glacial lake the size of one of today’s Great Lakes burst its dam of glacial detritus and send a wall of melted glacier water miles wide and hundreds of feet high down what is today the Columbia River basin. The massive flood brought soil and granite from the mountains of Montana and Idaho, along with pulverized wood from inundated forests along the way, to the natural basin now occupied by Portland, Oregon, and the hill areas south of Portland. The Missoula Flood reached what is now the Yamhill-Carlton AVA and crested at an elevation of about 320 feet (97 meters) at the site of our vineyards. The cresting of the Missoula Flood at what would become our vineyard site 12,000 years later brought a unique mix of highly mineral soils and glacial gravel that profoundly enriches the underlying sedimentary soils in our vineyards. The resulting mix of alluvial and sedimentary soils enables Domaine Verdant to make pinot and chardonnay wines with a highly distinctive mineral structure and finish that are the perfect complement to the intense fruit flavors conferred by our Dijon clones of pinot noir, pinot blanc, pinot gris, and chardonnay. Originally planted in 1998-1999, our 10 acres of vineyards are amongst the oldest plantings in the Yamhill-Carlton AVA and include only classic Dijon clones of pinot noir and chardonnay, as well as selected European clones for pinot blanc and pinot gris. Our seven and a half acres of pinot noir vines are divided roughly equally among Dijon clones 113, 114,115, 777, and Pommard. This palette of classic Bourgogne pinot types enables us to make exceptional single-varietal wines that beautifully express the distinctive character of each clone as it develops each season in our vineyards, as well as carefully selected blends of clones that express the unique microclimate and terroir of our Yamhill vineyards each season. Our small plantings of pinot blanc (Weissburgunder clone) and pinot gris (Colmar clone) — approximately 1⁄4 acre each – are dedicated to limited-quantity production of barrel-aged, single- varietal white pinot wines that artfully elicit the delicate fruit and floral characters that only attentive cultivation and winemaking can achieve with these classic European varietals. Our two acres of chardonnay include Dijon clones 76, 95, and 96, a portion of which were also planted in 1998-1999. The pairing of Dijon clones 76 and 96 from our vineyards yields chardonnay wines with stunning depth of stone fruit and tropical fruit flavors, complemented by a cleansingminerality on the finish conferred by our sedimentary and alluvial soils. Our Dijon clone 95 vines, planted in 2015, are slated for single-varietal chardonnay wines beginning in 2019. Our viticultural practices are founded on our deep commitments to the quality of our wines and to the preservation and enhancement of Oregon’s beautiful natural environment. As our friends and fellow winemakers in Bourgogne have long said, we believe that great wines are made in the vineyard. In our Domaine Verdant vineyards, we have only one priority: the growing of grapes that will produce wines that are consistently recognized as among the very best in the world. To that end, we have created a “culture of viticulture” in which everyone who works in our vineyards understands and lives out our commitment to growing the highest-quality grapes for our wines. What that means in practice is that in our vineyards we always choose quality over quantity and quality over economy or expediency. As a result, we spare no expense in our efforts to bring out the very best that each varietal and clone can develop in our vineyards. 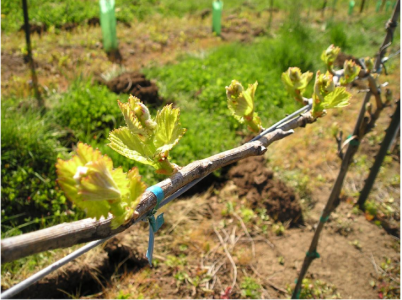 Unlike some viticultural areas in the increasingly consolidated and corporatized global wine industry, Oregon wines are still largely made by dedicated small producers who live on their wine estates and who are deeply committed to preserving Oregon’s beautiful natural environment. We share that commitment, and we follow through on our commitment by strictly adhering to LIVE-certified and Salmon-Safe viticultural practices that contribute to the sustainability and biodiversity of our natural environment.